COME CELEBRATE CINCO DE MAYO WITH LOS MONSTROS AT THE ABBEY BAR!! “Los Monstros” is based in the Central/Eastern PA region. Forming in late 2010, they bring a unique blend of cultures to the table in their own blend of romantic Bachata, English Pop/Dance, Reggae, Salsa & Merengue music. Playing together over the years in various salsa & merengue bands, the members recognized their unique chemistry and decided to embark on a new musical journey together. One of the primary contributions to the originality of their sound, is the fact that the lead singer is not even of Hispanic origin, and actually entered the world of latin music as a merengue trumpet player. Still he nurtures his own love of singing, as well as his desire to create musical and cultural fusion by blending his own romantic vocal style, along with the unique personal musical stylings of the rest of the band, together into a new expression of the most popular Tropical-Latin, English and International music of today. You can hear your favorite current hits, alongside re-arrangements of classic songs from all genres ranging from popular American love songs to classic merengues and salsas, even some American pop songs remixed to traditional Latin rhythms, not to forget the classic reggae standards (earning the nickname “Bachata Rasta”) mixed in a way you’ve never heard them before! Did we mention that all of this is accompanied by LIVE horns and LIVE percussion??? 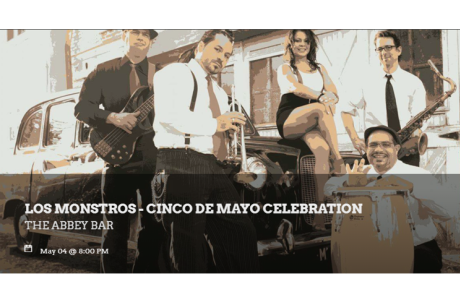 Truly a unique listening experience, “Los Monstros” breathe a fresh breath of life into your event with their genuine love of musical presentation and unique desire to fully entertain audiences of ALL cultures, no matter what the occasion! “Los Monstros” is based in the Central/Eastern PA region.